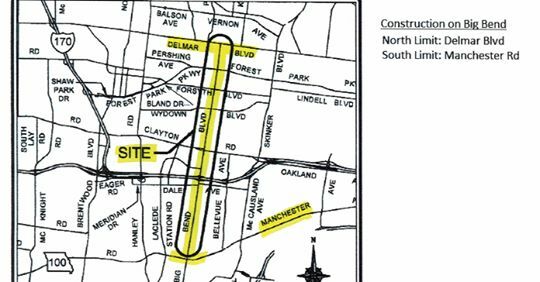 The City of Richmond Heights has received the plans for the St. Louis County Big Bend Boulevard resurfacing project, from Delmar Boulevard in University City to Manchester Road in Maplewood. The city announced the plan details on its website. The work is due to start in February 2019 and run through December 2019 with asphalt resurfacing taking place in the fall. The project through Richmond Heights will have new ADA ramps at each intersection, new curbs and sidewalks where needed, signal upgrades and a complete asphalt overlay. When will St. Louis County resurface Clayton Road in Richmond Heights? Yes it’s frustrating to see a newly repaved road get torn up and only partially repaved. It might take a bit longer to get the road done if utility jobs are not coordinated and completed before repaving. The best way forward is to call or contact anyone in the County Roads organization or County Government (it’s a County Road) and tell them your concerns before they begin. Otherwise it is all internet bit@hing for no good reason. True, although “internet bit@ching” can help. I’ve mentioned Big Bend to the County several times over the last few years. Guessing it just bounced off some time-server there, but maybe not. I cannot imagine how long it would take if all the utilities came along and replaced all their stuff under the road before the thing got resurfaced. But that is about the only way you can get a road that does not get chopped full of holes almost immediately after the work gets done. I really wonder if all that work to resurface the road doesn’t damage, loosen, disturb the pipes and anything else down there and in a few weeks they are back in there cutting open the street and patching things. Yeah, it’s a pretty messed up system. My solution would be forcing anyone who cuts the pavement to do an effective patch job. That means concrete, not just tossing everything back in the hole and covering with asphalt. Watching these bad patch jobs turn into craters is frustrating. Points to a ‘don’t-care, we get paid no matter what, that’s the way it’s always been done’ attitude on the point of everyone involved. I hope they will work on it daily to get it completed quickly. However, I’m glad it’s getting done. Or the crew running that clown show 44 cracked bridge project. Where do we send the bills for our battered suspension? What an embarrassment this has been. That stretch has been virtually un-driveable for about 5 years. 3rd world pavement. And I don’t believe that it’s poor paving or traffic volume. In my opinion, most of the craters are caused by utility and other contractors tearing holes in the roadway and then doing half _ssed patch jobs which quickly become sinkholes which then collect water and cause cracking in what’s left of the good pavement. If the county would get a handle on these guys, I think we could save huge money on road maintenance. Why pay the county to take care of our roads only to have them give our money to a bunch of guys who ruin the pavement? It should be a condition of touching the pavement that any repairs are inspected before contractors are paid or allowed anywhere near another roadway. I hope they can do a better job of this much needed resurfacing than they did on the turn lane at Manchester and Big Bend. That took forever to get done mostly, in my opinion, due to poor oversight by the City of Maplewood. Everyday the construction crew didn’t show up on the job site the City should have been calling the project manager and finding out where the hell they were. If they had done that it would not have taken 10+ months of traffic jams to get a simple turn lane completed. If they cannot do better on this resurfacing it could take years to get the job completed. That would be totally unacceptable. Do people actually use that turn lane? I saw someone avoid using it and turn right from the main lane. Hopefully the resurfacing won’t require all the utilities & signals, etc. be rerouted like the turn lane did so will take less time! About Time! Given the volume of traffic on this stretch of road, and the horrible condition it is long overdue. Remember how awesome it was when they resurfaced Big Bend south of Manchester?